Learn more about The Canadian Academy of Recording Arts and Sciences. Arkells perform “Hand Me Downs” at The 2019 JUNO Awards. Photo Credit: Ryan Bolton (top). 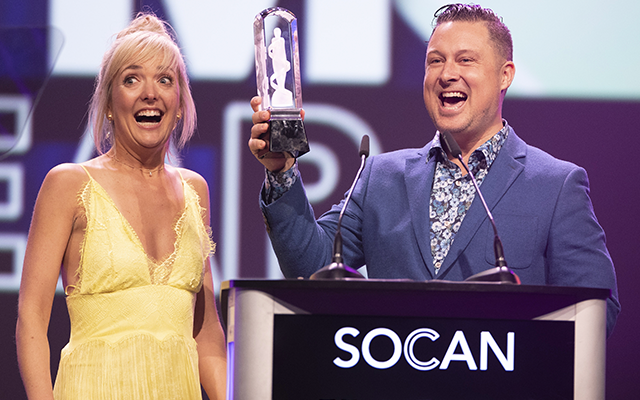 Splash’N Boots win Children’s Album of the Year at The 2019 JUNO Gala Dinner & Awards Presented by SOCAN. Photo Credit: CARAS/iPhoto (left). The Canadian Academy of Recording Arts and Sciences/L’académie canadienne des arts et des sciences de l’enregistrement (CARAS) is a not-for-profit organization created to preserve and enhance the Canadian music industry and to contribute toward higher artistic and industry standards. CARAS’ mandate is comprised of four key pillars: Educate through our music education charity MusiCounts programs and initiatives, Develop emerging artists through mentorship and development programs, Celebrate Canadian artists with year round JUNO Awards showcasing, and Honour music industry icons through the Canadian Music Hall of Fame.